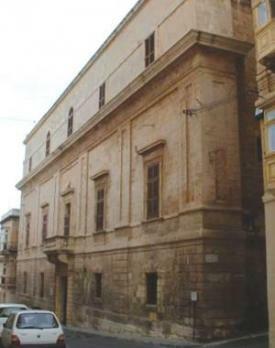 This building, which was originally built to house the Law Courts (Castellania) of the Order of St. John during the 1530s, was later used as the residence of the Inquisitor. It served as the law courts till 1571, even after the Order transferred its headquarters to Valletta. However, with the arrival of Mgr Dusina as the first general inquisitor in 1574, the Grand Master offered the property to serve as his official residence. Dusina and his successors all had similar backgrounds and thus they attempted to introduce Baroque styles prevalent in Roman ecclesiastical buildings until the building was transformed into a typical Roman Palace. The original design of the Castellania is attributed to the architect Nicolo’ Flavari but the main façade is attributed to Francesco Buonamici and Francesco Sammut. The Castellania consisted of a series of small to medium-sized rooms arranged around a central courtyard. Later changes incorporated certain elements of the original structure, especially the pointed arches. These changes were deemed essential to provide the inquisition with adequate space to function. Thus, various inquisitors acquired adjacent properties in order to enlarge the building. This entailed the undertaking of piecemeal works that resulted in the irregular plan of the palace. The Inquisitor’s Palace has been recently restored and is being used as the National Museum of Ethnography. It is located within the central part of Vittoriosa and promotes a style that was very popular in Europe and eventually South America. The palace’s survival can be attributed to the fact that it was occupied by high ranking authorities for the most part of its existence. Although it survived the onslaught of WWII, subsequent occupants carried out a number of insensitive interventions. Careful historical reconstruction respecting established conservation principles based on research and documentation is currently being undertaken. Inquisitor’s Palace, Triq il-Mina L-Kbira, Vittoriosa was scheduled by MEPA as a Grade 1 national monument in the Government Gazette dated December 22, 2009.